Sweet Disposition poses for you. 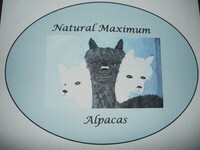 Natural Maximum Alpacas is now open for farm tours. The spacious park-like grounds are adorned with giant sycamores, a water garden with water fall, a reflexology pathway, and many other flower and garden landscapes. When touring you will also be given the opportunity to see, touch, and feel all of our cashmere-like raw materials and handmade finished products. Linda Mackey uses no patterns and all felted derby hats, crocheted scarves, gloves, and hats are all one of a kind. Have fun trying on the felted hats just like in the good old days. Hats are back especially made from alpaca fiber. Check out the alpaca loofah soap, unscented and surrounded with a kool-aid dyed rainbow of colors. We have named the colorful bars alloofahpaca soap. 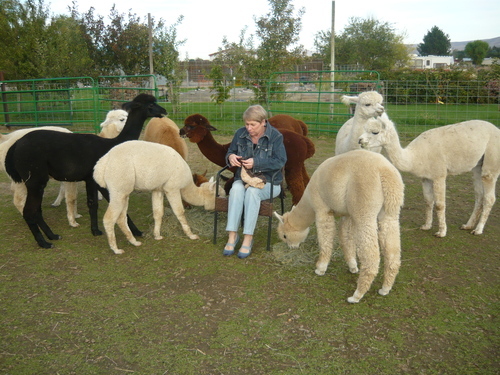 Feed and get to know the alpacas as they eat their way into lovely roving, felting, batting and luxurious yarn. 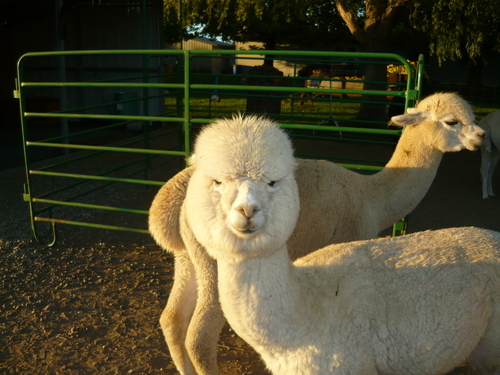 Our alpacas are sheared once a year and their fiber is sent off to the mill for processing. All are invited, for free, to watch this incredible procedure in the early spring. Give us a call and set up your tour. We are touring in late April through October when weather permits. Over the last five years Natural Maximum Alpacas has attempted to produce natural fibers. We not only use safe products but also are concentrating on a chemical free diet for our Alpacas. We use herbal medicines and an enriched natural/organic grain product with our own additives for a healthy, happy alpaca herd. Our Alpacas are on their way to being chemical free since they have been on the farm. They have both dry land and grazing opportunities at least nine months out of the year. The fiber is processed at our local mill where we turn it in to yarn, felt, batting, and roving with many luxurious twists. The next step has been to turn it into beautiful felt hats, clothing, and a variety of useful items that are sold at many events and boutiques.